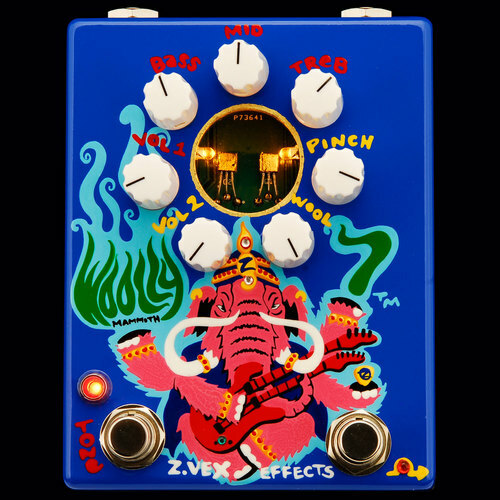 The ZVEX Woolly Mammoth features a Marshall ™ style tone stack with Bass, Mid, and Treble controls. This is a departure from the original Woolly with its single tone knob. The tone stack allows for expanded tone shaping capability. Being able to switch it in and out of the signal path makes it a valuable tool for sculpting fuzz into dense soundscapes. The tone stack is switched in and out of the circuit with the footswitch on the lower left portion of the pedal. This feature allows you to bypass the tone circuit completely. The WM7™ fuzz without EQ has its own unique voice, much different from the sound of a WM7™ with tone stack, or the single tone knob of the standard Woolly Mammoth™. The fuzz is more linear, with pronounced mid frequencies. Dimensions: 4.80" x 3.64" x 2.10"